Initially released in early 2017, Hollow Knight has since gained high praise, celebration and a cult following. This cult, though, is bound to expand into the mainstream due to the game’s recent, and rather auspicious, release on the Nintendo Switch. 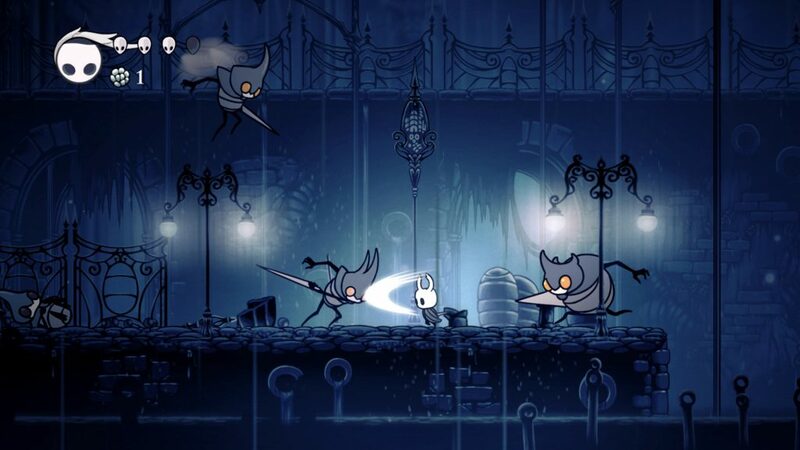 All this adoration isn’t without cause, as Hollow Knight (born from a successful Kickstarter campaign) rather triumphantly marries the Metroidvania style genre with “Soulslike” design philosophies, and follows through in an almost perfect way. At this point in time, this union is by no means unique, especially in the indie hemisphere, where hundreds of games including Ori and the Blind Forest, Hyper Light Drifter and Axiom Verge exist within the same influential flux. Some would say we’re on the verge of over-saturation. But much like the best of them, Hollow Knight uses the Metroidvania and Soulslike template to build itself its own identity, while adapting its inspiration into something akin to a true sequel. If you want the very best of what modern Metroidvania can become, Hollow Knight is it. 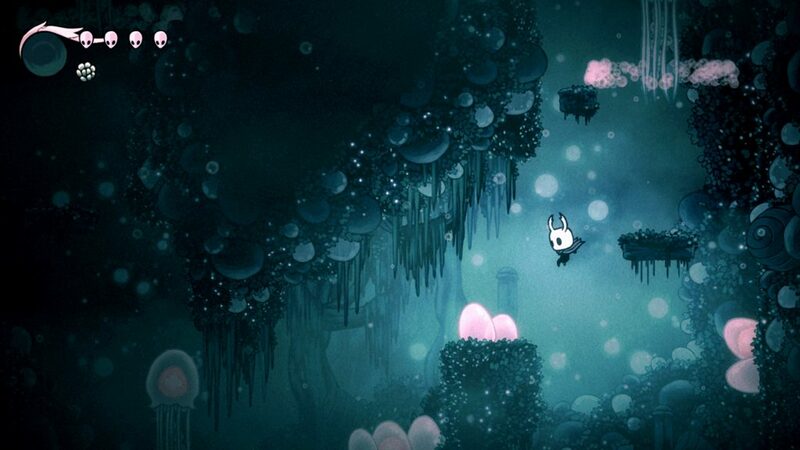 The term “atmospheric” can, at times, be a rather easy way to say the game has a certain kind of feeling to it without describing it fully, but in the case of Hollow Knight, “atmospheric” is the best descriptor for how the game looks visually. Misty, damp caverns, post-apocalyptic graveyards, and pollen, mold, and parasite-infested ruins stretch across the underground, ancient, abandoned kingdom of Hollownest. It’s an anthropomorphic bug world, and a blend of dark and foreboding with occasional comic relief, coming naturally from a setting such as this. If you’ve ever thought that the micro-landscapes of life as a bug seemed scary, especially when involving parasites and such, that’s the feeling Hollow Knight’s setting is great at conveying. Much like Souls/Bloodborne, the story of Hollow Knight is told through vague dialogue, environments, and item and enemy descriptions. The world is rich and full of implied history that can be explored if desired, but even without looking into it too deep, the presence of it is enough to tell a story of its own. The game’s art-style looks like moving, digital hand-drawn illustrations, of a cartoonish make. It’s not my preferred style of art, but I can’t deny that it’s a precise vision that Team Cherry stuck to rather consistently. Similarly, the music isn’t to my liking, as it is a grandiose soundtrack that at times overplays its hand, feeling like it’s compensating for emotion that is already present through visual design. But I can’t deny that it’s wonderfully composed, and will be to the liking of many who buy into its affiliation with the rest of the game’s art. All in all, the game’s bible of design, as it were, is fully realized and executed in a way that is identifiably “Hollow Knight”. It’s a unique world, with unique locations and NPCs, and you really want to explore all of it to see what’s around the corner. If you’re familiar with how you move around in “Metroidvania” classics like, well, Super Metroid and Castlevania: Symphony of the Night, you’ll find yourself at home with Hollow Knight. You have a similarly structured, interconnected map of rooms, in a layout that all but steals what works best in the aforementioned games and improves on them with modern sensibilities. You’ll also find yourself at home with Hollow Knight’s system of progression, as you unlock new abilities (like a double-jump, fast dash, etc.) to reach areas or collectibles which might have been previously inaccessible. As you trudge through the map, you’ll find yourself performing platforming maneuvers to get from the entrance of a room to an exit, all the while fighting enemies with varied move-sets, and all the while avoiding classic obstacles like spikes, acidic pools of boiling liquids, and buzzsaw blades. The controls are designed to become very second nature, a true extension of yourself, so all of this becomes pretty fun as you “solve” it. Exploration is one of the game’s strongest draws, especially once you have all kinds of abilities that let you go to all kinds of new places, but this issue can get in the way of that, working against the game. A way to circumvent this is manual waypoints (introduced in a patch after the game’s release), which come in a variety of styles and colors. It’s not the most ideal solution, but it’s sure to help you a lot on your journey to 100% (and more) the game. So you might be thinking that all of this sounds pretty brutal, and well, it is! Hollow Knight is not a walk in the park; it’s a rather challenging affair that will often have you facing threats you’ll not even know how to even come close to hitting once when you first face them. However, much like the Souls/Bloodborne games that it takes several cues from, the game’s difficulty is dependent on how well you can learn your enemies’ patterns and respond to them accordingly once you build you up your reflexes. If you’re familiar with “Soulsborne,” you’ll know that once it all clicks, it clicks, and the satisfaction present in that is abundant. 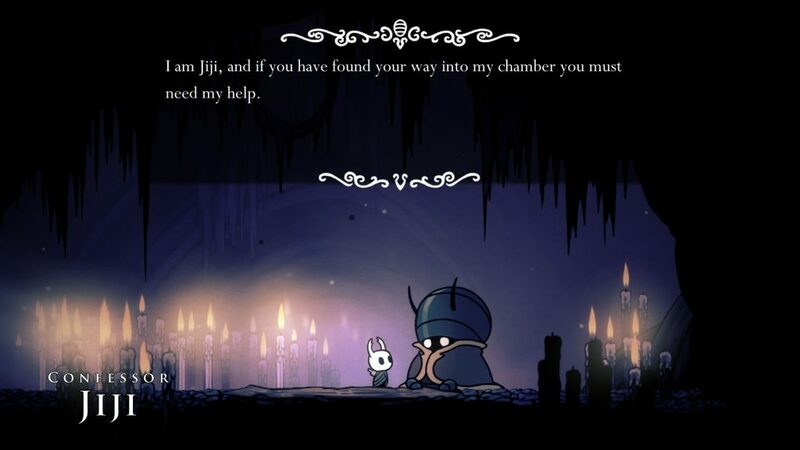 It is very similar in Hollow Knight. If you’re someone who doesn’t enjoy the playstyle of Souls but wants the same satisfaction born out of that design philosophy, you’ll definitely find it here. Your strategy isn’t limited to just reflexes and memory, however. Throughout your adventure, you can collect and purchase “charms” — accessories that can be applied to a limited number of “notches” for the player character. These grant special perks and abilities, like a protective shield, faster healing, better defense, temporary extra health, or a quicker focusing of your “soul.” Each “charm” takes up a different number of “notches,” so which ones you equip for a task at hand is part of the strategy. As you progress, your number of available “notches” increases via rewards and collectibles, opening up more possibilities. Beyond that, there is an “overcharm” mechanic where you can equip a “charm” that exceeds your limit of “notches” as long as you have at least one “notch” open. The consequence of this is losing twice the amount of health when hit, but depending on your strategy, it could be a risk well worth taking! While all of this could sound like a little too much, it’s these layers of strategic choices that really open up the possibilities of what you can do within Hollow Knight. Its difficulty blends well with all these options, helping you tilt the odds in your favor. How you use the arsenal provided to you is as much a part of the game as being good at reflex reactions. Hollow Knight is what I consider to be part of the “true evolution” of the genres it borrows from. It’s a wholly unique experience that, simply put, is a joy to play as a video game at its core. Not only does it present itself in a way unlike most games with which it shares its genre, but it also takes established ideas from its inspiration and applies them in a way that shows a deep understanding for the craftmanship of how to make a game that’s fun to play. Most of all, it’s “sui generis” status shows that there is always room for improvement within the most tried-and-true concepts. Gaming learned and went forward with Super Mario Bros. Hollow Knight continues that tradition with its own modern inspirations, and does in a form that represents growth, not just nostalgia.